Used 1957 Chevrolet Bel Air Black Red Color Combo! 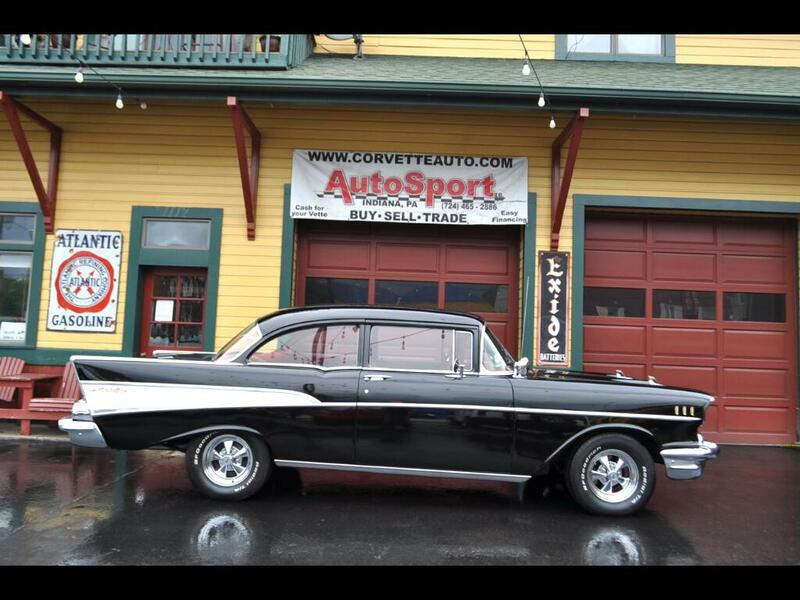 for Sale in Indiana PA 15701 AutoSport Co.
For Sale is a beautifully restored Tuxedo Black/Red 1957 Chevy Bel Air! This car has undergone a complete restoration by its previous owner. The Tuxedo Black paint is in excellent condition with a clean deep shine that’s ready for car cruises and car shows. The body is clean solid rust-free body. The door gaps look good, the hood and trunk fit good, and the panels are straight and clean. This car looks great standing on top of it and looking down the body lines. The chrome is in excellent condition and stands out against the Tuxedo Black Paint. The Red cloth interior is in good condition with no rips or tears. The gauges cluster was restored with the rest of the car and looks new. The overall interior is in excellent condition and shows well. The engine compartment has been restored and updated with a 350ci engine that runs strong! It has been outfitted with an aluminum radiator that keeps this car running cool. The engine compartment is in good order with a professional installation. The frame and undercarriage highlights the restoration that was done to this 57’ Chevy. There are disc brakes on the front of the car. The frame is a solid clean rust-free frame and finished in black. The suspension has been upgraded with new shocks. The front end has been restored and this car drives straight and is tight! The old school chrome Crager wheels with BF Goodrich tires gives this car some personality and they perform great! A real deal classic car that is an Icon is sure to compliment any collection or garage! Please feel free to call us at 814-977-9219 or email us with any questions.